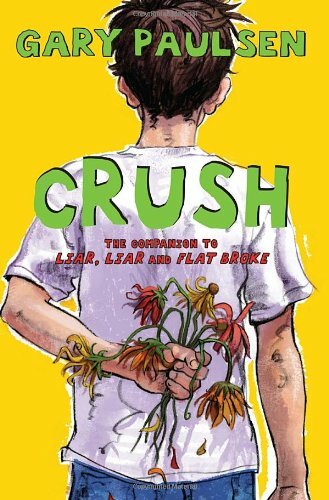 Quickie review today of a middle grade and/or middle school book that should be required reading for every young teenage girl who wonders what boys could possibly be thinking with courtship techniques that sometimes involve spitballs. “I’m the most romantic guy you’ll ever meet. Potentially, that is.” Kevin Spencer, 14 yrs old, would love to be Tina’s boyfriend, but first he has to be able to talk to her without making a fool of himself. He decides to make a study of love and dating to improve his chances, as his ego needs no work. Though he makes some wrong turns – hilarious ones, mostly – he also brings some people together and resolves his own crush. Paulsen has created a character with a lot of charm and humor. The book is full of funny lines, for instance Kevin's view of his parents' relationship: “In summation: Don’t annoy her, listen – and hear – her, and feed her. Except for the listening/hearing part, it’s kind of like having another cat. And I’m an excellent pet owner.” Does he stop experimenting and get the girl? Sure, but the fun is along the way. The shorter length of the books in the series – which includes Liar, Liar and Flat Broke – are great for reluctant readers in middle school. Boys will enjoy this relatable character and girls may find usable insight into the mind of a teenage boy in love. I adored this series, and this book was SO funny. I'll definitely have to get more girls to read this! A Gary Paulsen book I hadn't heard of yet. How exciting. Thanks for sharing the info.